Such was how Virgil Abloh's October 26 talk at the Harvard Graduate School of Design reached its conclusion. 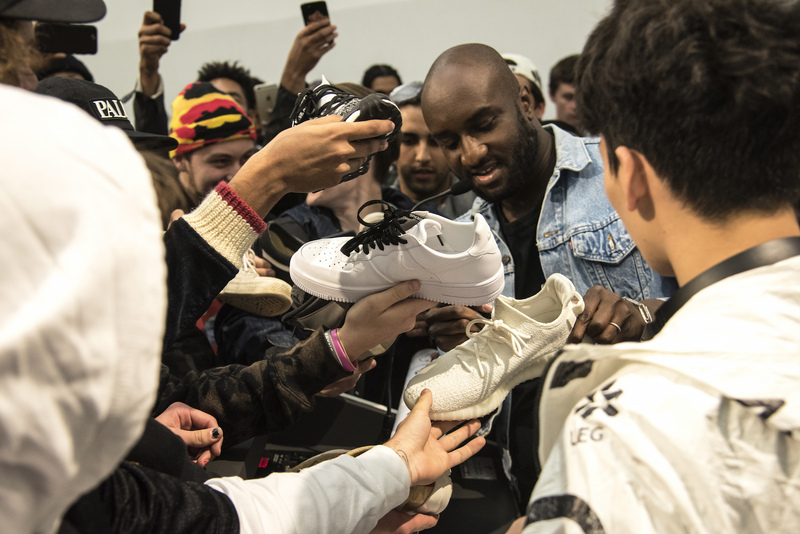 Entitled “Insert Complicated Title Here,” Abloh's talk encouraged the packed Piper Auditorium crowd (some attendees traveled from as far away as Syracuse, New York, to attend the talk) to find their creative voices and directions. Founder of the Milan-based fashion label Off-White, and collaborator with the likes of Ikea, Nike, and Kanye West, Abloh also passed around different prototypes of sneakers he has in the works, and shared photographs of concepts for a forthcoming furniture collection. Abloh, who holds a Master in Architecture from Illinois Institute of Technology, noted he's been inspired by the work of Rem Koolhaas, Donald Judd, and Jim Joe, among others. View Abloh's full GSD lecture via the GSD's YouTube channel. Toward the lecture's end, Abloh asked for the return for a sneaker prototype that he had shared with the audience. In return, he offered to autograph the first few sneakers that made their way to the podium. Ultimately, he autographed more than a few. Read the Gazette's full review via its website.